Halloween is drawing near – Monday October 31. Don’t forget to stock up on all your natural skin and hair care cleansing products from McArthur Natural Products so you can clean away the Halloween make-up, cobwebs and fake blood, and return your skin to its original radiant condition. 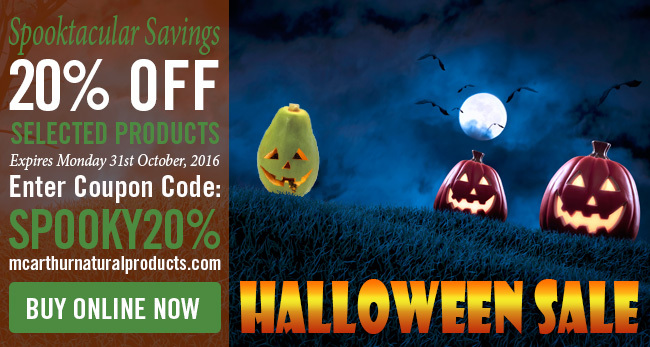 Save 20% OFF on these selected skin and hair cleansers with coupon code SPOOKY20% at checkout. Sale starts Thursday 27th October, and offer expires midnight WST Monday 31st October, 2016. Not available in conjunction with any other offer. Offer available in our online store only. To take advantage of this offer enter the coupon code SPOOKY20% at the final stage of the checkout to receive 20% OFF. Need a hand? You can also telephone our office on 1800 729 729 and we can assist in processing your order during office hours. Remember that you save even more with FREE Shipping on orders over $80 within Australia. Welcome to our eNewsletter recognising World Eczema Awareness Month. Globally the awareness of Eczema is held at varying times from country to country. But that is okay, the more awareness we create the better, and what better time than now to support an exploration of Eczema. In this eNewsletter we explain Eczema types and the impact caused from Eczema. Do you, or someone you know, suffer from Eczema? So what exactly is Eczema? The group of eczema skin conditions include; Atopic Dermatitis, Allergic Contact Dermatitis, Irritant Contact Dermatitis, Dyshidrotic Eczema, Hand Eczema, Neurodermatitis, Nummular Eczema and Stasis Dermatitis. For many, the effects of mild eczema, will include red, swollen and itchy skin with the skin often becoming dry. The itchiness may interfere with sleep patterns. The inflammation and itchiness comes and goes in its severity. 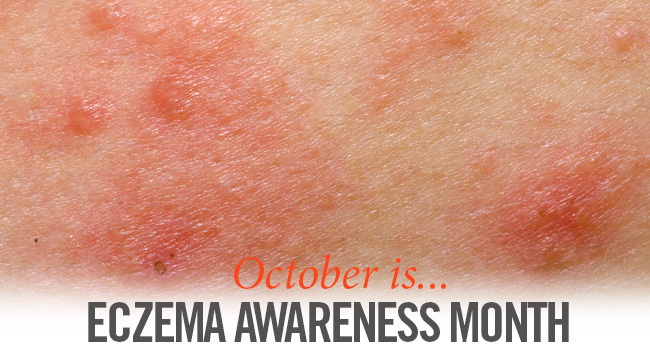 If you suspect that you may be suffering from Eczema please see your health professional. There is presently no known cure for Eczema. Avoid soaps and shampoos that contain detergent that irritate and dry skin. Avoid wool and rough materials that irritate the skin. Consider using a clothes drier as it can soften clothes. Line rough clothes with silk or boxer shorts. Saliva (dribbling, sucking fingers, dummies) may aggravate eczema around the mouth. Sand, grass and heavily chlorinated swimming pools may irritate the skin. Animal pet fur or saliva may cause allergy.